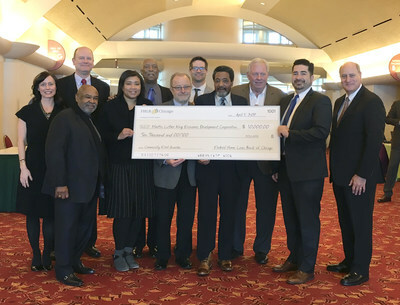 CHICAGO, April 8, 2019 /PRNewswire/ -- The Federal Home Loan Bank of Chicago (FHLBank Chicago) announced the final recipients of its 2019 Community First Awards on Friday, April 5, at its member meeting in Madison, Wisconsin. The awards recognize outstanding achievements of the FHLBank Chicago's member institutions and their local partners as they work together to strengthen their communities through affordable housing and economic development initiatives. Award winners select a nonprofit organization to receive up to $10,000. At its Madison, Wisconsin meeting, the FHLBank Chicago presented awards in the categories of emerging leader and partnership. 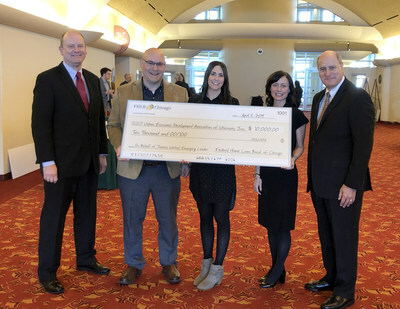 Jessica Wetzel, program and communications manager for the Urban Economic Development Association of Wisconsin (UEDA), identified UEDA to receive the $10,000 award on her behalf. Associated Bank nominated Ms. Wetzel for the award, recognizing her as a natural leader in Milwaukee's economic and community development sector. UEDA focuses on and advocates for community investment, sustainable homeownership and housing, regional transportation, small business growth, financial empowerment, and the local food economy. Ms. Wetzel helped build UEDA's Food Enterprise Development Network, connecting entrepreneurs to resource providers and business assistance, and launched the organization's Emerging Topics Series. "UEDA excels at building cross-sector collaboration in Milwaukee's economic development space. Jessica has emerged as a major force behind their Take Root Milwaukee program which promotes sustainable homeownership in Milwaukee," said Bill Kopka, Community Accountability Officer, Associated Bank. "Through Take Root, Jessica has created engagement opportunities where non-profit, government, and business partners share observations, create new ideas, educate on resources, and execute best practices. More broadly, through UEDA, Jessica helps the membership find and focus in on our common interests, and this supports growth in opportunities for the greater Milwaukee community." Martin Luther King Economic Development Corporation (MLKEDC) has received a $10,000 partnership award. The Wisconsin Housing & Economic Development Authority (WHEDA) nominated MLKEDC in recognition of the Five Phases of King Drive Commons. MLKEDC works to develop affordable housing and support related business creation initiatives in the Harambee neighborhood of Milwaukee. The Five Phases of King Drive Commons began as a neighborhood planning effort in 2001 and, over the course of the past 17 years, resulted in the new construction, acquisition, and rehabilitation of 166 housing units and 47,000 square feet of commercial space. Throughout this effort, WHEDA provided tax credits, debt, and/or equity to support the development. "WHEDA is extremely honored to receive this prestigious award," said WHEDA Board Chair Ivan Gamboa. "We are grateful to have partnered with Welford Sanders, founder of The Five Phases of King Drive Commons, on every component of his visionary crusade to literally transform a community. Many thanks to FHLBank Chicago for recognizing Sanders' work that is truly deserved." "Ms. Wetzel exemplifies what it means to be a leader in her community by modeling the values of collaboration, relationship building, and effective communication," said Suzi Thackston, FHLBank Chicago Community Investment Officer. "The ongoing work MLKEDC is doing with partners like WHEDA makes a positive and long-lasting impact in the community. We were proud to play a role in this remarkable effort to truly transform a neighborhood with the support of competitive Affordable Housing Program funds and we are delighted to honor these organizations with a Community First Award." The FHLBank Chicago also announced Community First Award recipients at its member meetings in O'Fallon, Illinois, on March 20, and in Green Bay, Wisconsin, on April 4. To learn more about FHLBank Chicago and its full range of Community Investment programs, please visit fhlbc.com or @FHLBC. "Community First" is a registered trademark of the Federal Home Loan Bank of Chicago.